Celebrate the spirit of Tennessee with an overlapping jamboree of guitars. Obsession manifests itself in various ways. For James Gulliver Hancock, it takes the form of a virtual road trip across the United States, where the artist happily examines, characterizes and delights in the quirkiest qualities of a particular locale. The Australian-born artist represents prominent cities from coast to coast by drawing an object that he felt typified a city or state and pulled his attention in each place. Nashville, Tennessee isn't named the Music City for nothing. For decades, singers, songwriters and toe-tapping fans have been flocking to Tennessee's capital. James personifies the home of country with an overlapping jamboree of guitars of all sizes, shapes and sounds. 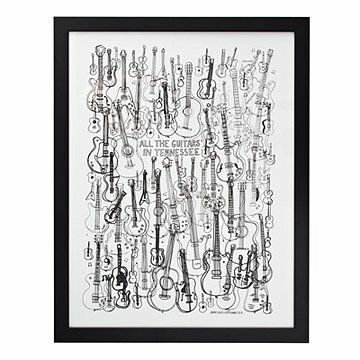 A fun way to relive a trip or to remember your old stomping grounds, this hand-pulled one-color silkscreen print on RFK Rives paper brings the spirit of the Grand Ole Opry to your very own home. Handmade in Brooklyn. Keep out of prolonged direct sunlight. Framed in Oregon. Also available unframed. For my son the best gift ever!! The greatest thing is that the picture is so unique. My son lives in Nashville and he is a professional guitar player. The perfect gift for him - he loves the picture. My husband has several guitars. He graduated from The University of Tennessee and he loves guitars, music and Tennessee. Special gift for my son who plays guitar, writes music,and loves all things Nashville! This print was a birthday present for my boyfriend. It looks neat and catches the eye. Up close, it literally looks like it was xeroxed. It is a cool picture, but not sure it was worth the price. My nephew collects, buys, repairs and sometimes sells guitars. This was the perfect item, a picture of all the guidtars in Nashville to add to his collection of real guitars haning on the wall. Great service, great product. Very pleased. You sent me the wrong poster!!! I ordered this as a birthday gift and when I opened it I had "All the Taxis" not "All the Guitars". So much for my son's birthday. VERY disappointed in this company and will not be ordering again.